Acute lung injury (ALI), adult respiratory distress syndrome (ARDS) and chronic obstructive pulmonary disease (COPD) are characterized by neutrophilic inflammation of the lung and marked decreases in lung compliance during ALI or ARDS, however during COPD there is increased lung compliance associated with progressive lung destruction. Although there is no specific treatment for ARDS and ALI, the clinical focus and overall goal is to provide ventilator support while minimizing the deleterious effects of mechanical ventilation on the lung in the form of ventilator induced lung injury (VILI). Due to the chronic nature of COPD, patients are treated with the combination treatment of bronchodilators to ease the work of breathing in conjunction with a corticosteroid to reduce baseline lung inflammation. There are no approved treatments that will reverse the lung destruction that develops during COPD. 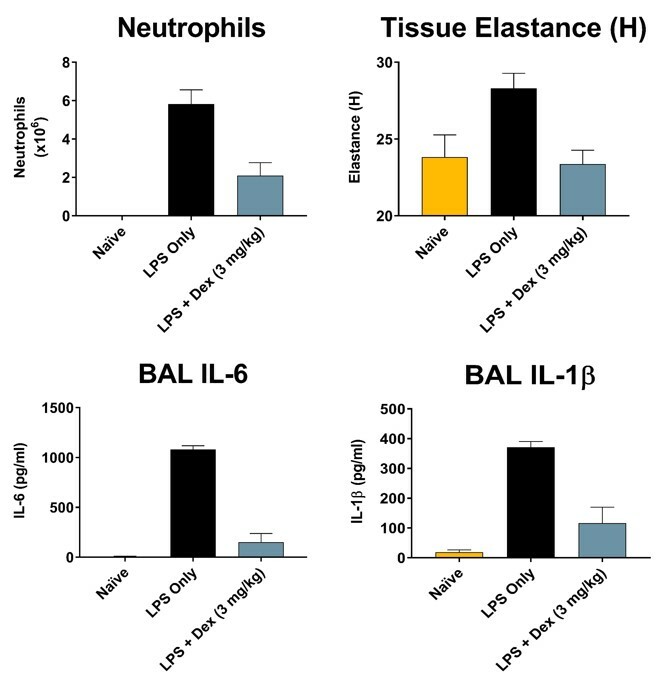 Biomodels offers a model of lipopolysaccharide (LPS) induced acute lung inflammation. This paradigm delivers challenges intratracheally or intranasally, and both recapitulate the hallmarks of acute lung injury including neutrophilic influx into the alveolar space, marked increase in lung and systemic inflammatory mediators, pulmonary edema and increased lung elastance (reduced compliance). The length of this model can be tailored to meet a specific application need, but typically lasts between 4-96 hours. Endpoints include broncho-alveolar lavage for total and differential analysis of inflammatory cells as well as cytokine profiling. Additionally, Biomodels has the capabilities to offer a functional analysis of detailed lung tissue mechanics (forced oscillations, airway hyperreactivity and pressure volume relationships) with the flexiVent mechanical ventilator as well as traditional endpoints such as gas exchange, histopathology and immuno-histochemistry. Neutrophilic models of inflammation are often used as a model for screening drug candidates or therapies for chronic obstructive pulmonary disease (COPD) and adult respiratory distress syndrome (ARDS). Glucocorticoids, in the example below dexamethasone, can be used as a positive control for use in LPS models. Biomodels offers a model of hydrochloric acid-induced acute lung inflammation. For this model, the challenge is delivered intratracheally which reproduces the hallmarks of acute lung injury including neutrophilic influx into the alveolar space, marked increase in lung and systemic inflammatory mediators, pulmonary edema and increased lung elastance (reduced compliance). This model generally lasts between 1-96 hours but can be customized to meet a specific application need. Like the LPS model, endpoints include broncho-alveolar lavage for total and differential analysis of inflammatory cells as well as cytokine profiling. Additionally, Biomodels has the capabilities to provide a functional analysis of detailed lung tissue mechanics (forced oscillations, airway hyperreactivity and pressure volume relationships) with the flexiVent mechanical ventilator as well as traditional endpoints such as gas exchange, histopathology and immuno-histochemistry.